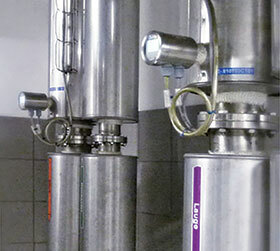 Process and storage vessels incorporate limit switches to prevent overfilling of a tank or vessel (full indicator) or dry running of a pump (empty indicator). Anderson-Negele’s NCS series are ideally suited for the reliable measurement of limits in media with low water content, such as certain alcohols and cosmetics, providing universal application in bottling and pharmaceutical applications. Anderson-Negele level switches operate on the basis of the capacitive working principle. The measuring electrode, the medium and the conductive wall of the tank form an electrical capacitor influenced by three main factors: distance; area of the electrode surfaces; andtype of medium between the electrodes. The measuring electrode and the tank wall serve as the capacitor plates while the medium acts as the dielectric fluid. Due to the higher dielectric constant of the medium relative to air, the capacity increases when the electrode is immersed in the medium. Exposing the electrode has the opposite effect. The change in capacity is analysed by the level switch and converted to a corresponding switching command. The sensor outputs a 24 V DC signal (active output). The minimum and maximum (full/empty) switching functions can be swapped by reversing the polarity of the power supply. The capacitive working principle requires that the sensor tip, which is made of PEEK, be completely immersed in the medium. The advantage is that the sensor does not respond to foam or adherences and a signal is emitted only when the medium reaches the level. Capacitive measurement is most reliable when the dielectric conductivity and temperature of the medium are constant. Changes in the outer conditions are generally non-critical in media with high dielectric constant values.